Jejuri Festival : Jejuri Temple is located in the Jejuri town, which lies to the southeastern part of the Pune city of Maharashtra. The temple is dedicated to Lord Khandoba. Khandoba is widely believed to be an incarnation of Lord Shiva and is worshipped as the presiding deity by the Dhangar, Teli,Ramoshi, and Mang communities and even by some in the Lingayat,Maratha, Deshastha Brahmin,Mali and Jains community as a incarnation of Lord Shiva. During Somvati Amavarsya, which is a new-moon day that falls on a Monday, a huge celebration is organized in Jejuri Khandoba temple. A palakhi (palanquin) procession of Khandoba and Mhalsa’s images is carried from the Gad-kot temple to the Karha river, where the images are ritually bathed. The palakhi procession is taken through temples in Jejuri and Khandoba is brought back to his temple before the end of Amavasya. Next Somvati Amavasya at Jejuri Khandoba temple is on 18th December, 2017. The main ritual of the day is the offering of Bhandara i.e turmeric powder. The temple premise is almost covered with turmeric powder, because the root of turmeric is said to be in the shape of a linga, a phallic representation of Load Shiva. Large amounts of Turmeric powder are thrown in and around the temple on that day. Devotees virtually bathe in yellow colour. 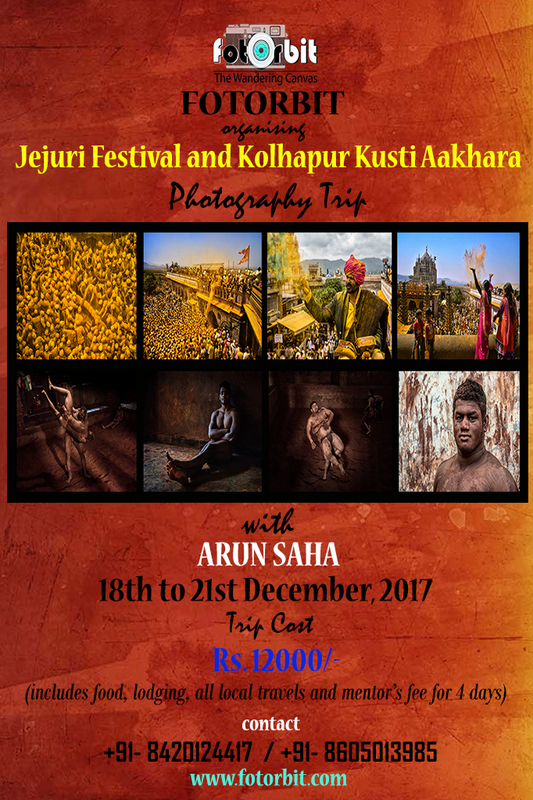 Thus the festival creates magnificent opportunities of capturing travel photography, portraits, candid moments and rich Indian culture. Fotorbit will conduct a day long photography workshop on this festival. Kolhapur Kushti Aakhara : Kushti, the traditional mud wrestling is the ancient sport in India and oldest in the world. Motibag aakhara of Kolhapur is one of the oldest aakhara in India. kushti takes place in a clay or dirt pit. The soil is mixed with ghee and other ingredients and is tended to before each practice. Wrestlers of aakhara live and train together and follow strict rules and a restricted life style. Soft drugs such as alcohol, (chewing) tabacco or even coffee and tea are not allowed. Wrestler lives off a high-energy diet that is supposed to build up body mass. The training schedule of a Kushti wrestler starts at around 4 or 5 am with exercises and practice matches. After lunch, wrestlers must sleep until the next training session of the day which starts around 4 pm and may last around two hours. During training sessions, wrestlers work themselves to near exhaustion. All these activities create amply opportunities of photography. Fotorbit will guide its clients to capture stunning images of this ancient sport of India. Day 1 : 18th December 2017 (Monday) : We will start from Pune at around 7o’clock in the morning, so that we can reach Jejuri temple before the rush hour starts. After covering the whole day program, we are expecting to return Pune around 7/ 8pm. Day 2: 19th December 2017 (Tuesday) : After breakfast start for Kolhapur from Pune. It will be 4/5 hrs journey by car. Reach Kolhapur by afternoon. Check in to hotel and get fresh. Evening shoot at kusthi aakhara. Day 3 : 20th December, 2017 ( Wednesday) : Morning and evening shoot at kusthi aakhara to capture different activities. Evening we will have discussion and review session. Day 4: 21st December 2017 (Thursday) : After breakfast, start from Kolhapur to Pune. Reach Pune by afternoon and drop you either airport/station/hotel as per your convenience. Our trip ends here. Workshop fee is Rs. 12000/- per person.